On todays menu: a re-review of the Devon Tread 1 , Casio's F-91W (Al Qaeda) 'Special', the Blancier Desert Wolf Militairy Chronograph and the Bremont C17 Globemaster . 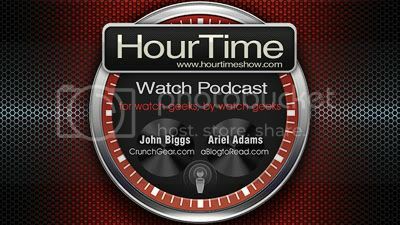 In this exciting episode we discuss the Jacob & Copany Cyclone and Caligula watches, the Nike Plus Sports Watch GPS by TomTom and the Zenith El Primero Stratos Flyback Striking 10th. In today's exciting episode Ariel speaks more about his time at Baselworld, how Switzerland needs better desserts, the Harry Winston Opus Eleven , Porche Design P-6520 Compass watch and the Omega Speedmaster Co-Axial Chronograph Caliber 9300 .